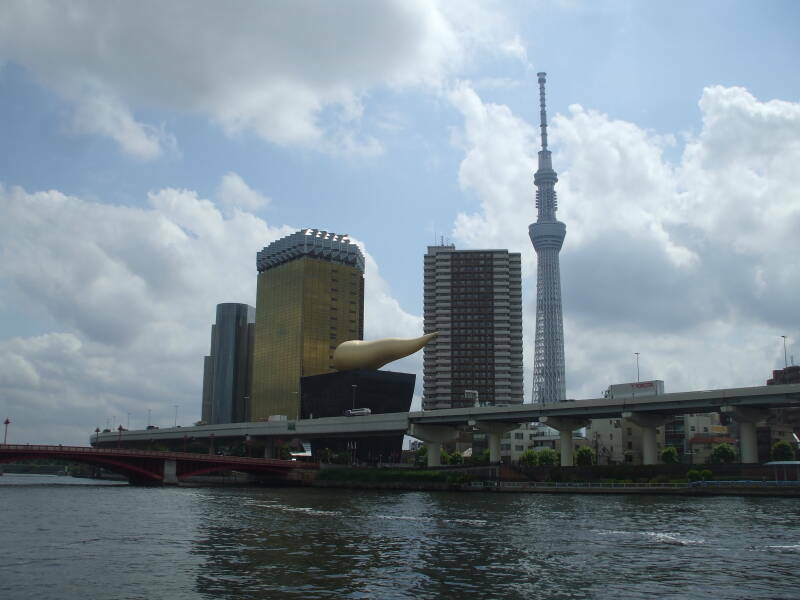 The Sumida-gawa, or the Sumida River, flows past Asakusa into Tōkyō Bay. 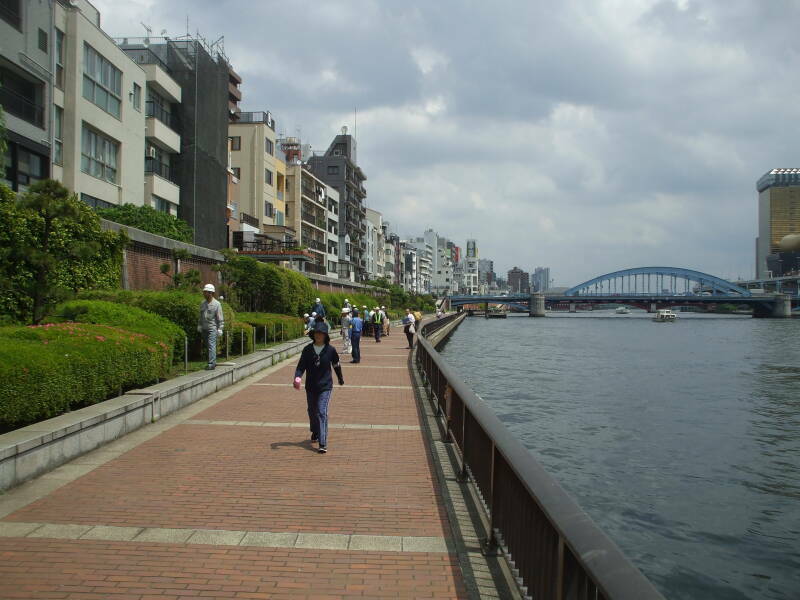 A series of 26 bridges cross the Sumida, spaced about one every kilometer. 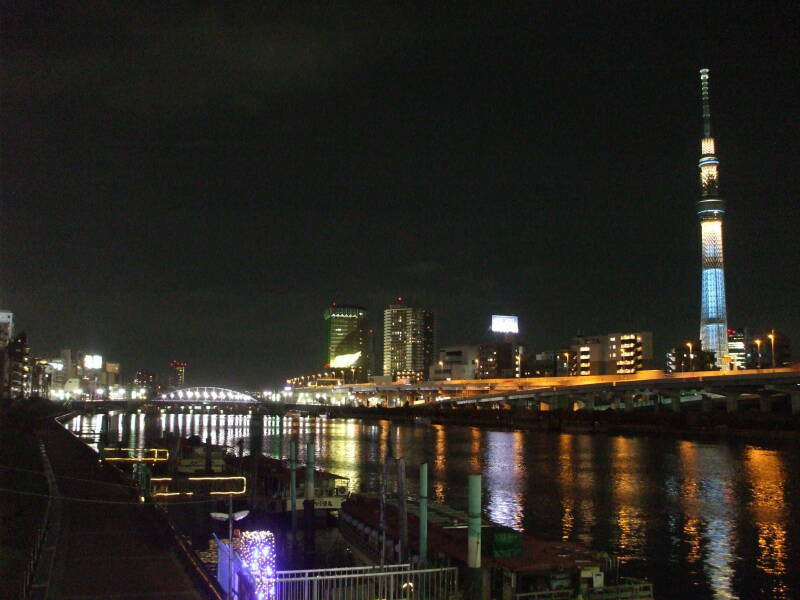 The western end of one of these bridges is at the Asakusa Station and the southern terminal of the Tōbu Railway. The eastern end leads past some unusual architecture to the Tōkyō Skytree. It has observatory levels at 350m and 450m. It is meant to resemple a 5-level pagoda, referencing the Sensō-ji temple complex in Asakusa. It has an earthquake-proofing design, including oil dampers and a tuned mass damper. 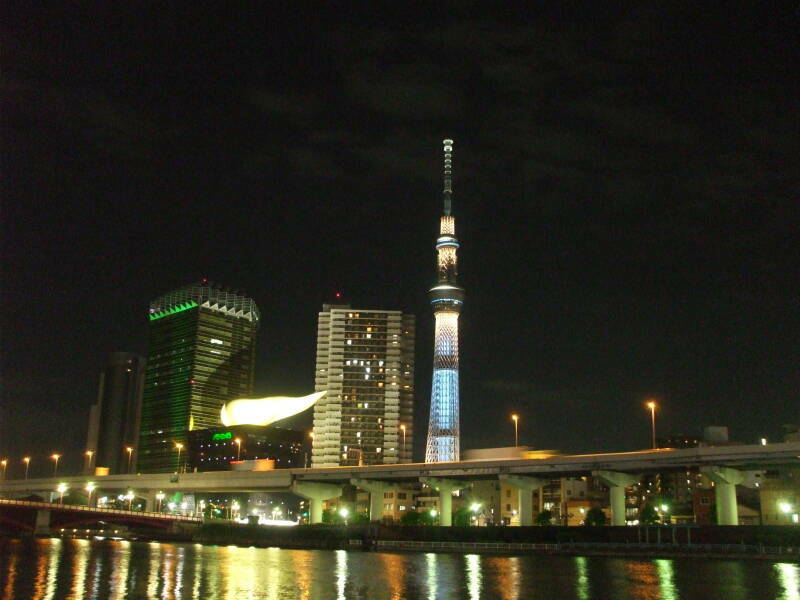 The Skytree is the primary radio and television broadcast site for the Kantō region. It broadcasts nine TV channels ranging from 3 to 10 kW power, and 11.5 to 68 kW ERP. Plus five FM stations on the odd Japanese FM band of 76-90 MHz: 81.3, 82.5, 90.5, 91.6, and 93.0 MHz, each 7 kW power and 57 kW ERP. 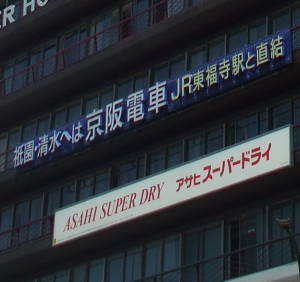 This Asahi Super-Dry sign in Kyōto was the first complete katakana thing I read. Pronounced. Whatever. 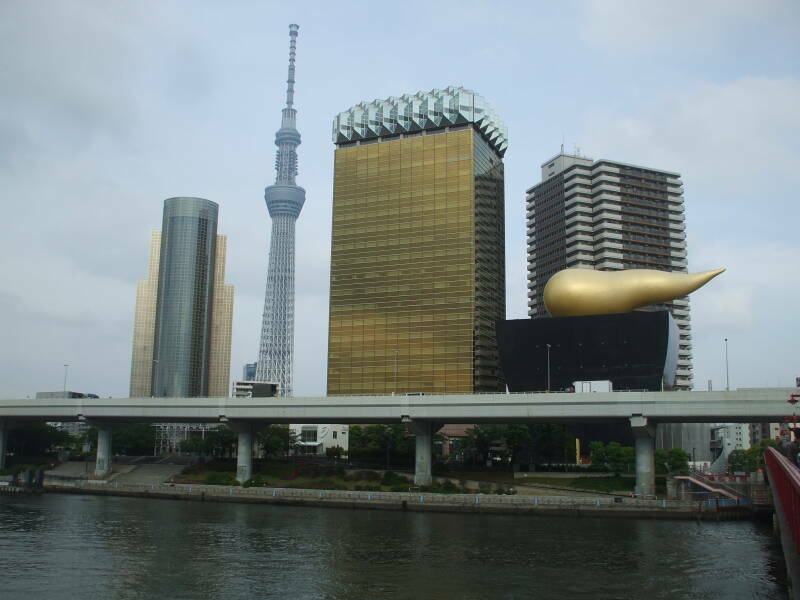 Closer to the river and the bridge to Asakusa you see the Asahi Beer Hall, also known as the Super Dry Hall and topped with the 360-tonne golden flame, the Flamme d'Or. The "flame" is said to represent "both the burning heart of Asahi beer and a frothy head". To me, it looks more like steam rising from a black cup of coffee or tea. Next door is a rectangular building shaped to resemble a beer glass. 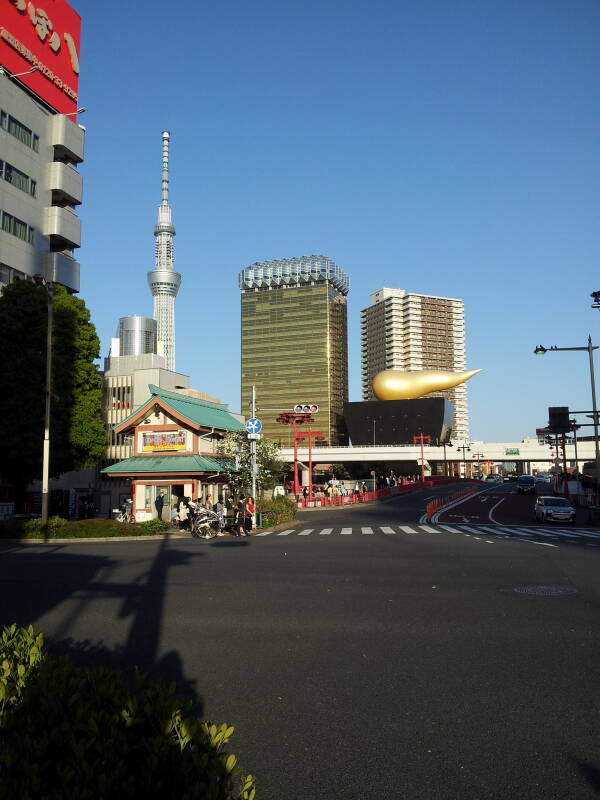 Asahi Flame is colloquially referred to as The Golden Turd, kin no unko, or 金 の うんこ, and Asahi Beer Hall itself as the Poo Beer Building, unko-biru or うんこ ビル. Kin no unko or 金 の うんこ, "golden poo", is a Japanese symbol of good luck. Its name is a pun, it means both "golden poo" and "good luck". In the below picture we're looking across that bridge. The Tōbu station is a block to our left, and the Asakusa station is underground with several entrances within a block. The small building with a green roof is a kōban, a small neighborhood police station. On my return to Tōkyō I stayed at the Nui Hostel. 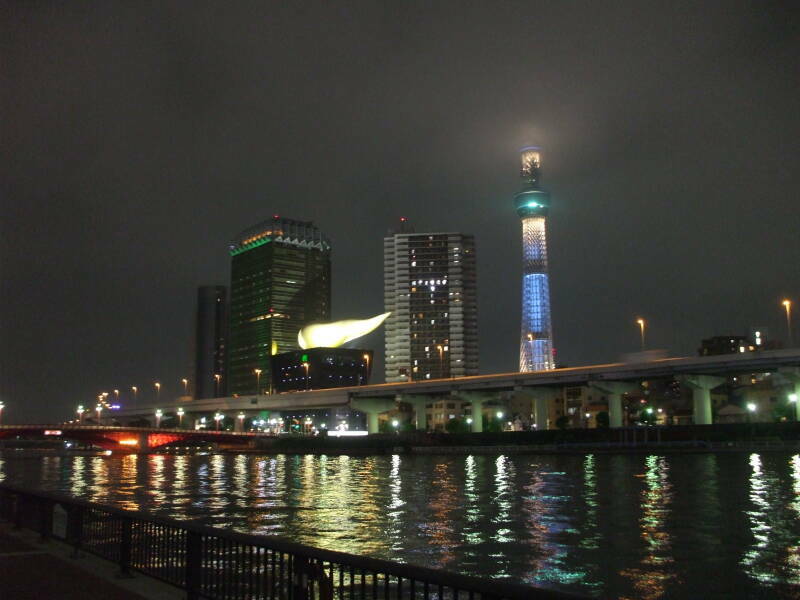 It's about a kilometer south of the Asakusa station, just south of the next bridge south on the Sumida. That made for nice views by day and night. An elevated expressway runs along the east bank of the river. One day I saw a demonstration of why Japan is so clean. This cleaning crew had 11 men. The leaders carried large bags. 5 to 7 workers passed over every spot, and every scrap was picked up. Two more men with a cart with bins followed behind.